When you’re new to the game of golf, wedges can be a big lifesaver. They can help you get out a sticky situation when you’re near the green or find yourself in some type of hazard. Your performance with wedges can ultimately make or break your score. Unfortunately, wedges are often the last thing new golfers think about. Novice players are so focused on their swing and body position with drivers that they neglect to practice with their wedges. Wedges are a type of iron that’s typically included in standard sets. If you’re still getting the hang of things on the course, it may be in your best interest to invest in additional quality wedges made for beginners. There are many types of wedges available that are designed to help players make the most out of those final shots. They’re very forgiving and relatively easy to use, allowing you to master your technique. Here are seven of the best wedges that you should consider if you’re a beginner or high handicap player. This sleek wedge from Callaway gives you all the versatility you need on the course. The unique design allows you to get a variety of results based on your playing condition. The S-grind is effective for a range of swing techniques and shot types. There’s also a Progressive Groove Optimization system that lets you manipulate the ball’s spin the way you want it. The weight ports on the back of the clubface also allow you to reposition weight to get more power. The wedge is available in lofts ranging from 46 degrees up to 60 degrees. 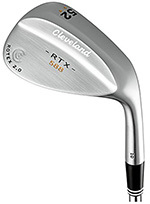 This option from Cleveland Golf is designed to give you the loft and spin power you need to get out of hazards. The face has the maximum roughness allowed by the USGA. This is accomplished through a micro-milling process. The grooves are also deeper than traditional wedges. When the ball is hit, it can achieve significant spin to get back on the green without rolling. It’s available in loft angles up to 64 degrees. The bounce angle is significant, so you’ll have no problem making it out of the rough or a sand trap. The shaft is made from steel and has a regular flex for versatility. If you need help with accuracy and power, this wedge from Tour Edge may be a great option. It’s designed to improve accuracy by changing your grip. Weight is added at the end of the grip to provide the counterbalance needed to keep your hand stable. It puts your wrist in the prime position as you swing. The sole is also considerably wider than traditional wedges. This can make problematic shots easier to pull off. 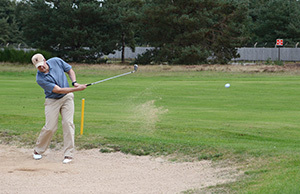 The wider sole easily glides through sand or grass. More weight is also added to the bottom of the club so that you can launch the ball higher and further during the upswing. Available in loft degrees between 52.09 degrees and 58.08 degrees, this wedge from Mizuno can help you get out of a number of tight spots. It’s designed with versatility in mind. The rounded sole grinds allow you to shape your shot the way you want. Whether you take an open stance or a closed one, you’ll still be able to stay aligned with your target trajectory. The face is precision milled with quadruple cut grooves. This rough surface allows you to achieve an efficient spin that can stop your ball from bouncing or rolling once it hits the green. 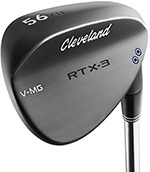 This Cleveland Golf wedge can help new and high handicap players by providing more control. The bounce angle is moderate. The sole has a V-grind that cuts upwards in the middle. This lets you cut through the terrain easily at impact for a smoother follow up. The club face is also altered with an extra 9 grams of weight. This weight is removed from the hosel and positioned at the center of gravity for better impact. There’s also laser micro-milling and deeper grooves for better spin. 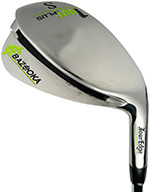 The wedge is available with loft angles between 46 and 64 degrees. A great selection of wedges at your disposal is key to rounding off a hole successfully. Even skilled players have their go-to wedges that they can rely on. Each wedge is designed to perform a specific task. While they may look similar in design, tiny differences in design achieve different results. The main goal of a wedge is to cover a small distance with high loft and spin. Each loft in your bag should be designed to offer varying degrees of loft and spin so that you can choose an option that’ll help you in the specific situation you’re facing. Wedges made for beginners and high handicappers provide you with a little more leeway than traditional options. With these wedges, you won’t have to hit the ball perfectly or even choose the preferred wedge for the situation. Over time, you’ll get familiar with the complexities of short shots. Beginner wedges give you the opportunity to learn what types of wedges are appropriate for each shot and what you have to do to be successful. Referred to as the PW, the pitching wedge is the most common club you’ll use. It’s often included in iron sets and should be the first type of wedge you master. They have a lower loft between 44 and 48 degrees. As a result, you’ll get less spin on your ball. The ideal situation to use the PW is when you’re approaching the green. You can use it to shoot a short distance with minimal roll forward. As the name implies, the gap wedge is designed to fill the space between the PW and higher loft irons. They have a moderate loft angle between 50 and 54 degrees. They’re perfect if you’re on a slight angle but don’t need a ton of height to reach the green. They’re relatively easy to use as they can achieve good results with just a natural swing. When you find yourself in a sand trap of tall grass, sand wedges will be your go-to wedge. The SW has a loft angle between 54 and 58 degrees. This lets you get high enough to get out of the sand with ease. Thanks to their thicker head, you can also hit the ball with less spin. Lob wedges are similar to sand wedges in that they let you get achieve a high shot with little spin. However, the LW has the highest loft angle of all. It lets you achieve an angle of 54 degrees or more. They can help you get over tall obstacles and to the green with a soft landing. What Makes a Good Beginner or High Handicap Wedge? Wedges come in a variety of shapes and designs. To the untrained eye, there’s not a lot of difference between a standard wedge and one made for beginners. However, manufacturers utilize many design features and technologies to make a wedge beginner-friendly. Here are some things to look out for when choosing wedges for your bag. One of the most important things to pay attention to is how forgiving the club is. When you’re a new player, hitting the ball perfectly on the center of the clubface is a rare thing. Wedges made for beginners are designed to minimize some mistakes you may have made on your swing, allowing you to improve your technique without sacrificing your score. The way manufacturers achieve this feature is by subtly manipulating the design of the face. Manufacturers may increase the area of the club face, make the topline thicker, widen the sole, or include a cavity on the back. However, one of the most common ways this is achieved is with perimeter weighting. On standard wedges, most of the club’s mass is in the center. This affects the moment of inertia when the ball makes contact. To be successful, you have to hit the ball in the center, often referred to as the “sweet spot.” With a wedge made for players with a high handicap, that weight is distributed evenly around the perimeter of the face. What does that do for your swing? It gives you a bit of wiggle room so that you can achieve the same results without having to be so perfect. The bounce refers to the angle of the edge of the wedge. They can range dramatically from 0 degrees up to 14. If you’re a beginner, it’s recommended that you go with a higher bounce angle. At the very least, your wedge should have an angle 10 degrees. This will help you get more comfortable swinging on variable terrains. The bounce can affect the way you make contact with the ground. A lower bounce may result in your club digging into the turf. 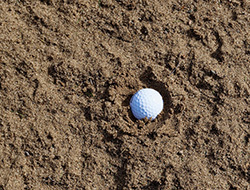 With a higher bounce, there are fewer chances for you to ruin your shot by hitting sand or dirt. The grind is the piece that protrudes on the sole of the wedge. Depending on the design, the grind can be a thin piece of metal or a wide contour. They help you shape your shot. Your swing, the particular grind, and the bounce angle can ultimately affect the direction and effectiveness of your shot. Typically, seasoned players will choose a grind that complements the way they play and stick with it. However, as a beginner, it’s best to go with a grind that’s versatile. Proficient golfers will often adjust the way they swing to ensure that the ball goes exactly where they need it to. This is true with all shots, but more so with short shots. Your best option while learning is to invest in clubs that don’t need constant adjusting to be successful. There are many wedges out there that can help you even if you haven’t learned how to precisely manipulate your swing with every shot. These types of wedges are easy to pick up and start using with very little experience. These wedges also tend to be very versatile. They can be used for multiple situations or when you’re not exactly sure which iron to go with. If you’re having trouble with short shots, wedges for beginners are a worthy investment. They’ll give you the control, accuracy, and versatility you need to play a great game of golf. You’ll be able to learn more about the technique behind short shots without sacrificing your score.